Welcome again at 3835group. Today i have more information for you. Do you want to know what is that? This is about Bali Destination especially Denpasar City destination. First of all, I would like to explain how you reached the city of Denpasar in order to advance. You reach Denpasar approximately 30 minutes from Ngurah Rai International Airport. to reach the city of Denpasar, you can use public transportation such as can Sarbagita, car, motorcycle, taxi, or transportation online and others. Denpasar city is located at a height of 0-75 meters above sea level, located at position 8 ° 35'31 "to 8 ° 44'49" south latitude and 115 ° 00'23 "to 115 ° 16'27" east longitude. While the Denpasar area of 127.78 km², or 2.18% of the total area of Bali Province. From the use of land, 2,768 hectares is the land of rice fields, 10,001 hectares is dry land and the remaining area of 9 ha is other land. Precipitation levels by an average of 244 mm per month, with a fairly high rainfall occurs in December. While the average air temperature around 29.8 ° C with the lowest average of about 24.3 ° C. Badung River is a river that divides the city of Denpasar, this river empties into the Gulf Benoa. Denpasar City population growth rate per year within the period 2000-2010 amounted to 4%, with the ratio of the number of male population more 4:57% compared with the total population of women. Approximately 68.4% of the population to Hinduism, while Islam is the largest minority religion other than Christianity, Buddha and Confucius/Kong Hu Chu. Strong influence on the tourism development and structural changes in the economic improvement of Denpasar. However, the economic structure of the city of Denpasar slightly different when compared with the structure of the economy of Bali Province in general, by placing a trade, hotels and restaurants dominate the formation of Gross Regional Domestic Product (GRDP) Denpasar. Go well boost the economy of Denpasar is the production of craft items such as handicrafts for souvenirs, such as carvings and sculptures. But the craft industry is being subjected to pressure, in addition to the impact of the crisis and competition between regions, other pressures coming from competition among other Asian developing countries such as Vietnam, Thailand, India, Malaysia and China. The competing countries maximize the huge scale of production by utilizing the technology industry, while in Denpasar handicraft industry still retain skills (hand made) so that an obstacle to the fulfillment of production quantity. Denpasar city has had good health care facilities in the province of Bali, there are three hospitals owned by the government such as Sanglah Hospital in Denpasar, Wangaya and RSAD Udayana Hospital as well as 13 pieces of private hospitals. Tourism development and attractiveness of the island of Bali, indirectly promote the progress of development in the city of Denpasar. In 2000, the number of foreign tourists who come to visit reached 1,413,513 people, and put the number of tourists most of Japan followed from Australia, Taiwan, Europe,UK,USA,Singapore,an Malaysia. Policy development of tourism in the city of Denpasar pariwasata culture focused on environmentally sound. As one of the centers of tourism development, Denpasar become a barometer for the advancement of tourism in Bali, this can be seen with the emergence of star hotels as a means to support the tourism activity. Sanur Beach is one of the coastal tourist area crowded. 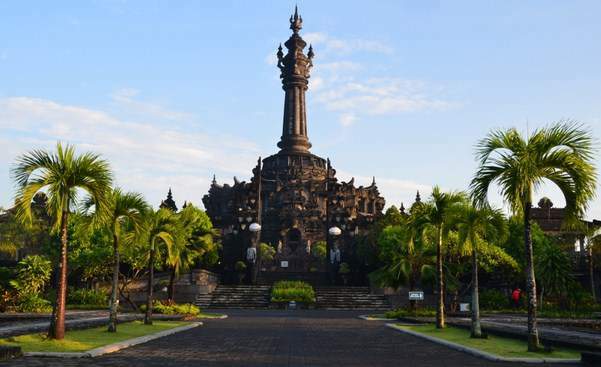 While Puputan Square is an area of open green space in the city of Denpasar also functions as the lungs of the city. Ok Bro and Sis, That is information about around Denpasar, please don’t forget to read next information details about destination of Denpasar. 0 Response to "Denpasar Bali, One Tourist Destination In Bali"